The uninhabited Island of Nikouria (4,5 km long) is located straight in front of the „carribean finger“ of [intlink id=”agios-pavlos-beach” type=”post”]Agios Pavlos beach[/intlink]. It is easy to access by a permanent boat shuttle service (4 euros per person) starting at 11:00am and closing at around 7:00pm straight in front of the tavern of Agios Pavlos beach. It will take you around 10 minutes to reach the island per boat. Historically the island is well known for its production of coins in antiquity and later was used as a shelter for lepers from the mainland. Nowadays you will find there just a few goats and a small apiculture. Three really nice sandy beaches on the island offer you a quite uncrowded, wind and rough-sea protected private atmosphere. On the bigger (most north) beach there is a little bar offering you snacks and drinks and music (opened only in main season). To change between this and the second beach you can either take the ferry boat when it passes by or you have a 15 minutes walk from one beach to the other, passing the small church of Panagiata and enjoy a nice panoramic view to Agios Pavlos. All beaches are soft and sandy with rocks surrounding, enjoyable for little kids and families. 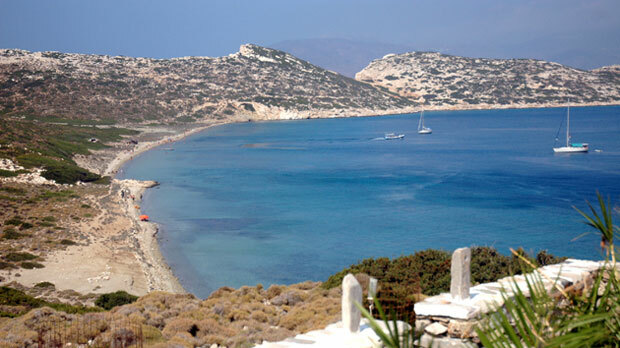 Being on Nikouria you will immediately have the „Island-on-Island“ feeling. Clear water and the attractive underwater world is also inviting you for snorkeling on Nikouria’s shoreline and perhaps to swim to the close-by Island of Gramvonissi. Mt. Chalara the islands 345 m high peak is easy to access from the beaches via a 1:30 hour walk and offers a phantastic 360 degree view to Amorgos and the surrounding islands. Beeing on top of Mt. Chalara you can see both the more soft and greened east side and the steep falling rocks on the west side of the island. Paul Delahunt-Rimmer August 15, 2010	Log in to reply. Please note that it is not an all year round boat service to Nikouria. They only run high season. This also depands on demand. They start when there are enough people here who would use the service and stop when trade drops off. It is different every year.